Kalapattar is in Nepal word meaning black stone or black hill. It lies down in opposite of Mt. Pumori is in Everest Base Camp. Kalapathar or Kalapattar is the world one of the best view point. Every year, many travels have own aim to run the feather of Mt Everest. 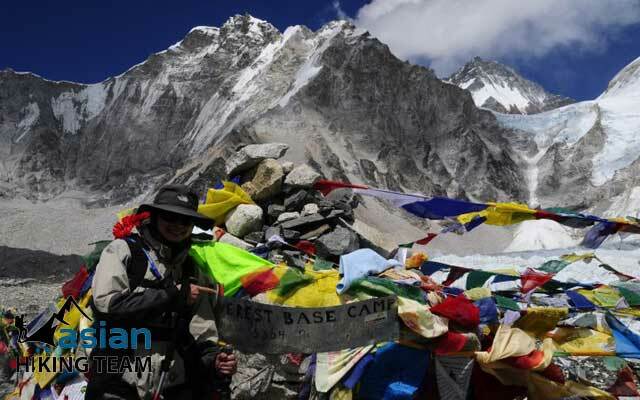 One of the primary goals of an Kalapathar trekking is the Everest base camp or Sagarmatha Base camp at an elevation of about 5370 meters. However, you cannot see Everest from the base camp, so most trekkers climb Kalapattar, at 5545 meters bump on the southern flank of Pumori (7145 meters) which is highly rewarding for the views over the entire Khumbu Mountains. To get near Kalapathar, you must either walk from Jiri 12 days or fly to Lukla and walk 7 days. Many trekkers or climber uses fly to Lukla and take two days to reach Namche Bazaar. Namche Bazaar is the Sherpa’s head quarter. 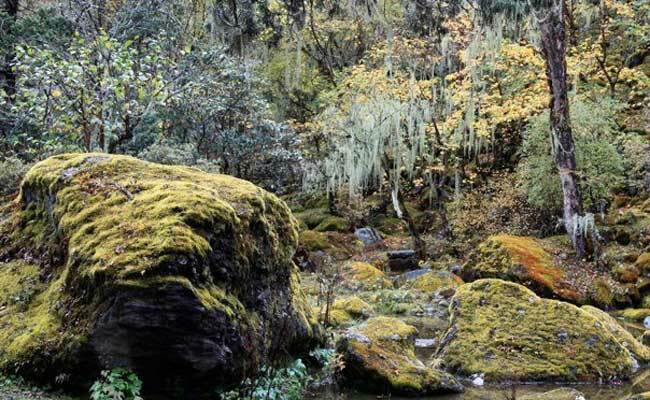 Explore the National park office, monastery, Sherpa museum, Everest view point, homeland of Sherpa village Kunde and Khumjung need one full day. Continue walk to 4, 5 hours to reach Tyangboche, the famous monastery. Many tourists join the daily worship celebration in Tyangboche monastery. Passing through the Pongboche village, recommend an acclimatization day in Dingboche the altitude of 4410m. From Digboche, bring you two days to Gorap-Shep. Group-Shep is the last spot for tea house trekkers. We will bring you to Kalapattar for the billion of fantastic views and return either same way or passing Chola to Gokyo valley. Highlight of trip: World best view point from Kalapattar, culturally exciting Sherpa way of life, Monasteries, Sherpa museum, World highest Peak Mt Everest, Breathtaking views of Everest, Adman Hillary School, culture and festival. Day 01: Kathmandu (1315m) - Lukla (2840m) - Phakding 2640m), 4 hours (B/L/D). Day 02: Phakding - Namche (3440m), 6 hours (B/L/D). Day 04: Namche Bazaar - Tyangboche, (3860m), 5 hours (B/L/D). Day 05: Tyangboche - Dingboche, (4350m), 6 hours (B/L/D). Day 06: Dingboche – Acclimatization (B/L/D). Day 07: Dingboche - Lobuche (4925m), 6 hours (B/L/D). Day 08: Lobuche - Gorakshep (5170m) - EBC (5370m)-Gorak-shep, 7/8 hours (B/L/D). Day 09: Gorak-shep – Kalapathar (5545m) - Pheriche 6 hours (B/L/D). Day 10: Pheriche – Tyangboche 6 hours (B/L/D). Day 11: Tyangboche – Monju 5 hours (B/L/D). Day 12: Monju - Lukla 3/4 hours (B/L/D). Day 13: Lukla - Kathmandu (B/L/D). Everest National Park permits, fees. Hot and cold drinks, shower, internet, telephone. Day 01: KTM - Lukla – Phakding 2640m 3.30 hours (B/L/D). Day 02: Trek to Namche Bazaar 3440m 5.30 hours (B/L/D). Day 03: Namche Bazaar for Acclimatization rest day (B/L/D). Day 04: Trek to Tengboche 3768 meters 5 hours (B/L/D). Today, we start our trek at 7.30 AM over the Dudh Kosi River can see the Mt. Everest, Nuptse, Lhotse and Amadablam view. One and half an hour walks slowly, going up to reach Kyanjugma – Sarnaso. There is two ways we follow left steeply down to Photse Tenga. Cross the Dhus Kosi Bridge, we have lunch in there because of before Tyangboche there is not any sport for lunch. After lunch we climb up all the way to Tyangboche 3768m 2 hours. Tyangboche is very famous for view and the Monastery. Every day 6.30 AM and 3.30 Pm is the Puja (praying time). We will join the Puja to success out trip. Overnight Lodge. Day 05: Trek to Dingboche (4410m) 5 hours (B/L/D). Today, we start early around 7 to 8 o’clock. Half an hour down to Debuche, where is monastery and small settlements inside the alpine forest. After 45 minutes walk to cross the bridge, continues climb to reach lower Pangboche. We are not plan to visit pongboche village because of we directly plan to go Dingboche. If you are so interest we can short visit as well, you can talk with your guide. Have a lunch in Somare and gradually walk up. 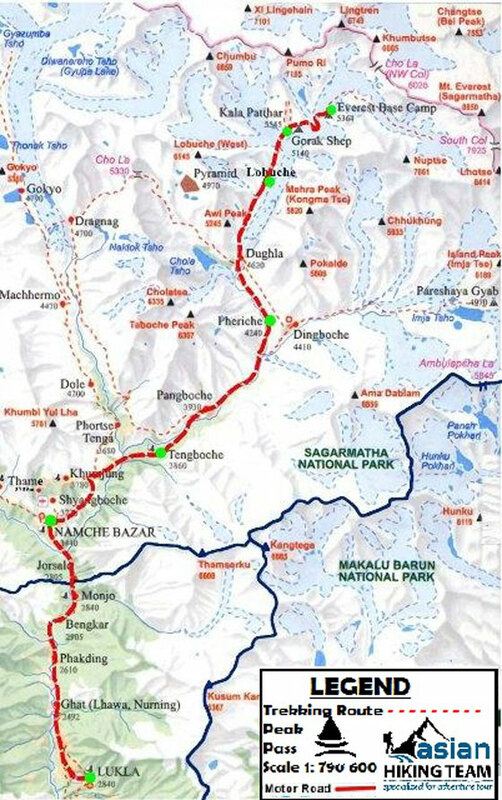 There is two way, one heading to Pheriche and other is Dingboche. Right hand side direction is our way to Dingboche takes us 1.30 hour to our hotel. After our arrival, have a short drinks with rest and climb 200 meters over the Nagarjun hill because of everyday we “ascent high and sleep in low”, Overnight guest house. Day 06: Rest day in Dingboche, overnight guest (B/L/D). Today is rest day, we can visit the Monastery over the hill top its takes 2/3 hours to see the view of Mt. Makalu which is above 8000m High Mountain or we can explore opposite of Dingboche, cross the Imja Khola and steeply climb near the Amadablam Mountain O/N Lodge. Day 07: Trek to Lobuche 4910m meters 5 hours, overnight hotel (B/L/D). Trek to Dhukla may we have lunch and climb to Dhukla pass where many memorials monuments who died in Everest summit. It takes 5 hours to Lobuche, Overnight lodge. Day 08: Trek to Everest Base Camp (5365 meters) then trek back to Gorak-Shep (5180 meters) 7 hours (B/L/D). Day 09: Trek to Kalapattar (5545 meters) then trek down to Pheriche (4230 meters) 6 hours (B/L/D). After reaching Base camp of Everest our aim today is to trek Kalapattar (5545meters). We start early morning before sunrise to reach the viewpoint that offers some of the best views of Mount Everest as well as other panoramas of the surrounding mountains. Kalapattar means “Black rock”, most excellent view point in the world. After late breakfast descend to Pheriche at elevation of 4230 meters 6 hours. Overnight at Guesthouse. Day 10: Pheriche – Tyangboche 6 hrs, (B/L/D). We return back same way to Tyangboche 4 hours overnight in Lodge. Day 11: Tyangboche – Monju 5 hrs (B/L/D). After breakfast we start trek same way back to Namche Bazaar and Manju 5 hours. Overnight tea house. Day 12: Monju - Lukla 3 hrs (B/L/D). Today is last day of our trekking. It is short and easy to down in Lukla, transfer to hotel and celebrate last night in Mountain. Day 13: Lukla – Kathmandu (B/L/D). Early morning flight to Kathmandu than transfer to Hotel. If you want to visit Kathmandu please let us know. Overnight in Kathmandu.